Why aren’t digital calendars smarter? When it comes to third-party calendar and to-do apps, the App Store is flush with possibilities. But that doesn’t mean there isn’t room for improvement or experimentation. Cal, Any.do’s new calendaring app, attempts to show you your schedule in a way that lets you maximize your free time during a day. I took the app for a brief spin on Wednesday; here are some of my initial impressions. Cal is a pleasure to get started with; you just press a few buttons to import your calendar settings and grant access to your contacts and you’re ready to go. You can toggle which calendars you’d like visible, set your default calendar for new events and your default list for new reminders, and when the week should start (Sunday or Monday). 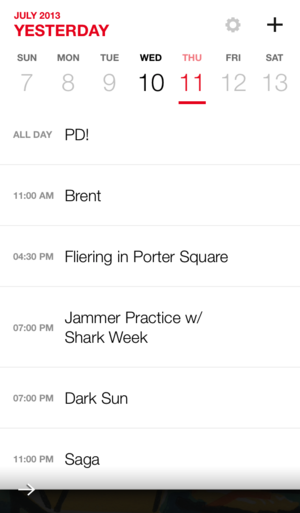 Unsurprisingly, Cal takes design cues from both iOS 7 and minimalistic third-party apps in its default appearance: Your calendaring info is presented in red and grey on sleek white cards which hover atop photographs and illustrations. 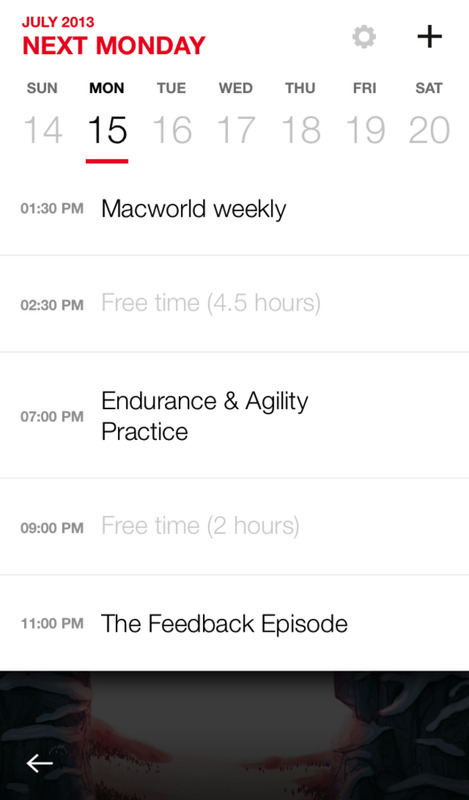 Like Fantastical, you can view your calendar by week or by month, with the highlighted day’s events shown in a list below that. 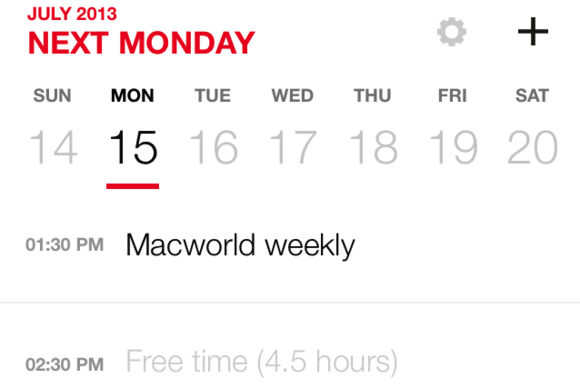 You can scroll to go forward or backward by week or month, depending on your view. You can tap any of these info cards to edit them; the tiny squares at the bottom of the screen represent information you haven’t added to an event yet—the people attending, for instance—as well as a button for deleting the event. 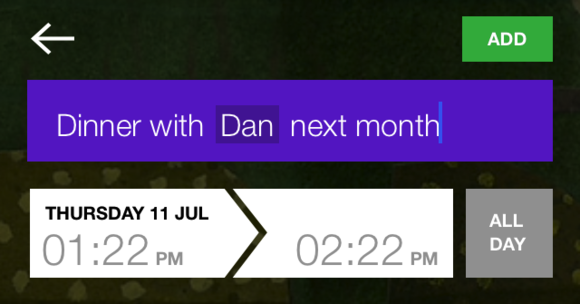 To return to your main calendar view, tap the back arrow (or pull down or up to get to the next event in your calendar). You can also view the underlying photograph at any time by tapping on it; the white boxes fade away, bringing the picture to the forefront. Photos can be pulled from one of nine themes: Art, Fashion, Food, Landscape, Animals, Design, Cars, Animations, or Illustration. Unfortunately, you can’t currently connect your photo library with Cal, though I’d love to see that functionality in a future update. Any.do recognizes names and places, but you don't appear to be able to add dates semantically. Overall, the animations flow nicely, and navigating the app is a breeze—though I occasionally ran into stuttering when trying to edit individual information cards within an event. Cal is also great with semantic dates—dates show up both by number and as phrases like “next tuesday,” “today,” or “in a month.” Strangely, it’s not quite as intelligent when adding new events: It knows that “with” should pull up your contact list, and “at” a list of places, but I couldn’t seem to make Cal add a date or time by typing alone; instead, I had to manually select a day and time from the dropdown menus. One of Cal’s nifty features is time awareness; if the app spots gaps in your schedule, it lets you know that you have free time (along with how many hours it spans). To fill it up, you can tap that free time and make an appointment—the app suggests a pizza date by default, but you can add whatever you like, really. Free time in your day is labeled with the amount of time you have available. In keeping with the “your device should know who you are” theme that third-party apps love so much, Cal can use your contacts list to add people to your events; remember where you live, work, and like to eat; and search the Web for new and exciting places to visit. 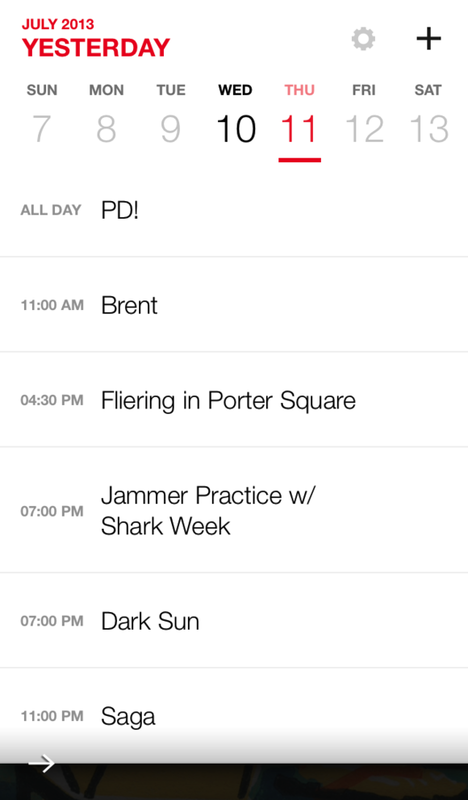 It’s a really nice way to personalize your events, and really does make your calendar feel a little more lively. I especially like that you can add people from your address book without sending them invitations to an event—for instance, you can make a “Coffee with Doreen” event for your own personal records without actually making Doreen accept said event and put it on her own calendar. Tap the Mail or Message button to send a group email or message to your event attendees. I have a few quibbles with Cal here and there—I wish that I could view events while adding a new one to a particular day, for instance—but overall, I found myself pretty impressed with Any.do’s new app. 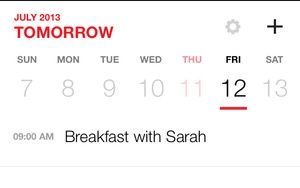 Though I wish it had more of Fantastical’s semantic mastery, its design and personalization options still give it a leg up in the third-party calendaring world. Cal is available now for free on the App Store; give it a whirl and see what you think.